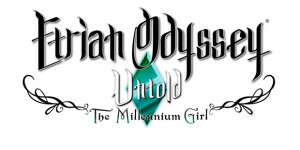 Etrian Odyssey Untold: The Millennium Girl is an enhanced remake of the original Etrian Odyssey game, which was released back in 2008 (2007 for the United States) for the Nintendo DS. The game was infamous for its unforgiving difficulty, which put off a lot of players. 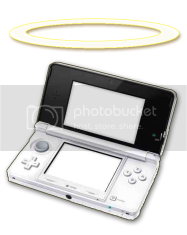 However it still managed to draw in a following due to its unique draw-your-map system combined with challenging gameplay unable to be found elsewhere in other DS titles. Etrian Odyssey Untold is extremely similar to the recently released Etrian Odyssey IV, a lot of the basic gameplay mechanic remain unchanged. Please refer to my review if you’re unsure of what EO4 game involves. 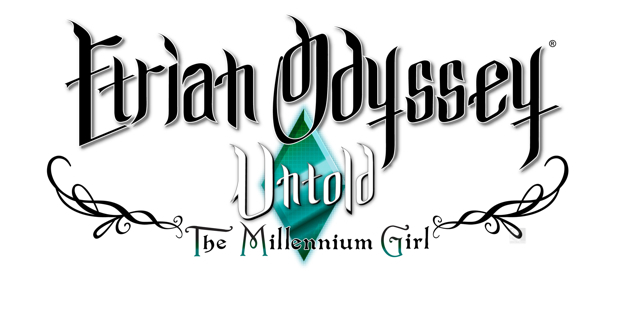 I will be mostly covering all the changes in Untold, comparing it to both IV and the original Etrian Odyssey in this review. As opposed to Etrian Odyssey IV’s Easy and Normal difficulty choices, Untold allows players to switch freely between three difficulty options during the game: Picnic, Standard, and Expert. Picnic Mode is a rather stress-free experience, infact even more so than IV’s Easy mode ; battles require less strategy, there are no Game Overs, and you have unlimited use of certain items. Standard Mode is recommended for players who have actually touched a video game at some point in their lives (I had a go at Picnic Mode for several minutes and found myself incapable of falling in battle unless I purposefully did nothing at all, so I absolutely stand by my recommendation of going with Standard difficulty, even if this is your first RPG). 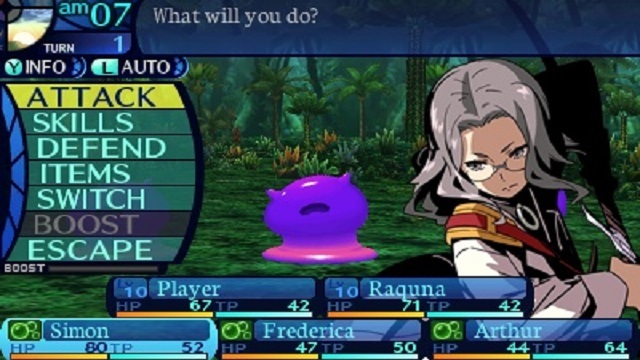 There is the choice of choosing to play Classic Mode or Story Mode when starting a new game; Classic Mode is your standard ‘Create a guild of custom made party members and go kill some monsters’ gameplay mode that should be familiar to every Etrian Odyssey player. Story Mode allows you to take control of a preset party of five characters: The player-named Highlander, the enigmatic, female gunner, Frederica, Raquna (a female Protector), Simon (an intelligent Healer), and Arthur (a young, cheerful Alchemist). 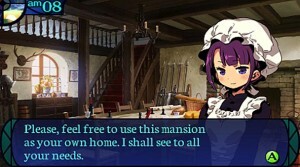 Story Mode offers a more unique experience to what’s been seen before in Etrian Odyssey games. As the name implies, there are important plot points related to the characters. Additionally, there are voice-acting and anime cutscenes to make the player feel more immersed in the game. Another addition to the series that I might as well mention here are the Grimoires, which are special stones that you sometimes acquire after battle. When equipped they allow characters to use skills and equipment from other classes, allowing them to use abilities that they wouldn’t otherwise learn on their own. There is also the option of synthesizing Grimoires in order to carry skills over from one to another to build your ideal Grimoire for each character. Of course, this eliminates the restraint of having five set classes for the characters ; Grimoires are a nice way of letting you play with skills from other classes. Other various enhancements include more icons for your dungeon maps and a choice between the classic and the arranged soundtrack for the game, which is a nice addition since Etrian Odyssey games have fantastic music. There’s a whole new dungeon that you frequently revisit that’s also tied to the main plot of the game. One thing I love about the game is the fluidity ; the options menu allow you to customize the animation speeds in battle, as well as the auto-battle animation speed. You can even hold down the B button while exploring to sprint. In addition to that, you can now jump to any staircases leading to the next level of the labyrinth by simply touching the stairs icon on the touchscreen (provided that you already explored most of that floor beforehand). This allows players to easily jump between floors without having to manually walk. I was extremely impressed with this implementation and I can see that ATLUS is finally beginning to see how important it is to not waste the player’s time by putting in these simple, but useful additions to the game. 3DS RPG goodness at its finest! 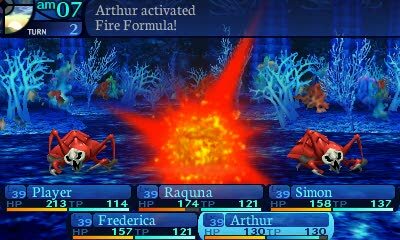 Etrian Odyssey Untold is a perfect introduction to the series and is easily the most accessible of all five games. If there’s anything I have to complain about it’s that the character classes and their skills feel rather underwhelming compared to those seen in IV. For example ; I wasn’t a huge fan of the Story Mode’s main character’s Highlander class, as many of his skills seem to be a bit too demanding for such underwhelming results. Of course, the exploration does feel rather restricted compared to IV since there’s no airship exploration, but you can see the effort that’s gone in to the game and ATLUS did a fantastic job of making a six year-old game feel modern.